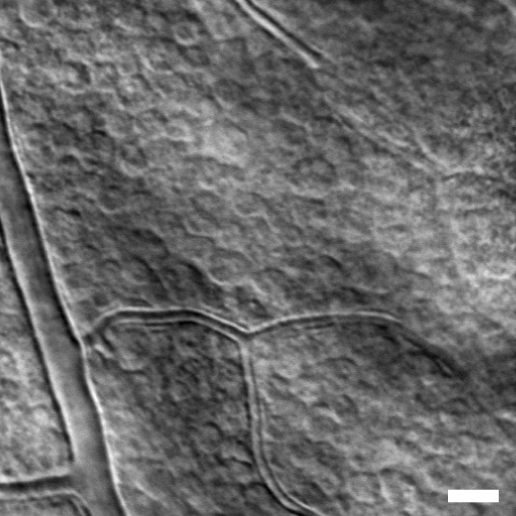 Retinal ganglion cell layer neurons imaged using the multioffset technique in AOSLO. The goal of this project is to obtain images like this of ganglion cell layer neurons in patients with glaucoma and to track their changes over time. For more information on this image and the multioffset technique, please see this publication. Scale bar is 25 microns. Our goal is to understand the earliest changes to the individual cells that form the optic nerve, the retinal ganglion cells (RGCs), in patients with glaucoma. To accomplish this goal, we are developing new optical systems and imaging techniques to see these cells and track them over time in the living eye. Current clinical tools lack both the resolution and the contrast needed to see these cells in the living eye. The way the eye works is that light must pass through the RGCs to reach the photoreceptors, (i.e. the rod and cone cells that sense light). To allow that, RGCs are nearly transparent, making them very difficult to image. We use a technology called adaptive optics that corrects the imperfections present in all eyes to achieve high-resolution images, and couple this with advanced methods for detecting the small amount of light that emerges from the eye to see these cells. We are using these new tools to image the structural features of individual cells, such as the cell body and the axons of the cells, which are long fibers that extend from each neuron and together form the optic nerve that transmits visual information to the brain. Although we know that vision loss in glaucoma is due to the death of RGCs, it is not clear what the earliest changes are that these cells undergo prior to death. Once these cells are lost we currently have no way to restore them. If we can detect the earliest changes to RGCs in glaucoma, before vision is impaired, we can provide early diagnosis and a long window of opportunity for treatments to prevent vision loss. These imaging techniques will also be useful for monitoring the efficacy of future treatments. This project is supported by a grant from the BrightFocus Foundation to Dr. Rossi, and supplemented by Dr. Rossi’s startup funds from the University of Pittsburgh Department of Ophthalmology and by the University of Pittsburgh Department of Ophthalmology core grant from the National Eye Institute.